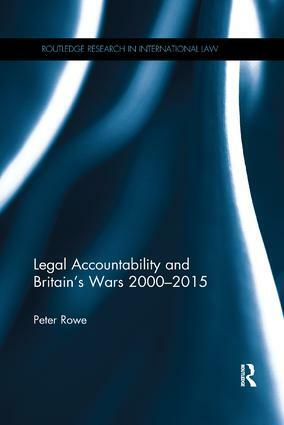 This book discusses the manner in which Britain’s wars, which took place between 2000 and 2015, have interacted with the relevant principles of international law and English law for the purpose, primarily, of considering legal accountability. During a debate in the House of Lords in 2005 a former Chief of the Defence Staff commented that ‘the Armed Forces are under legal siege.’ The book will discuss the major legal issues which have arisen, ranging from the various votes in Parliament to go to war, the constitutional relationship between ministers and senior commanders, the right under international law to use force, the influence of human rights law, the role of the courts in England (including the coroners’ courts), to the legal regime applying to the conduct of UK military operations. It will assess critically whether the armed forces will now have to accept that operations conducted outside the UK are subject to greater legal scrutiny than previously and whether, if this is the case, it is likely to hinder their future military activities. This book will be of great interest to scholars of international law, the law of armed conflict, military studies and international relations, as well as to those with a professional or other interest in the subject matter. Professor Emeritus Peter Rowe retired from the University of Lancaster Law School in 2014. He has been chairman of the UK Group of the International Society for Military law and the Laws of War.